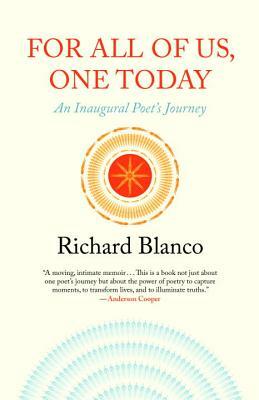 For All of Us, One Today is a fluid, poetic story anchored by Richard Blanco’s experiences as the inaugural poet in 2013, and beyond. In this brief and evocative narrative, he shares for the first time his journey as a Latino immigrant and openly gay man discovering a new, emotional understanding of what it means to be an American. He tells the story of the call from the White House committee and all the exhilaration and upheaval of the days that followed. He reveals the inspiration and challenges behind the creation of the inaugural poem, “One Today,” as well as two other poems commissioned for the occasion (“Mother Country” and “What We Know of Country”), published here for the first time ever, alongside translations of all three of those poems into his native Spanish. Finally, Blanco reflects on his life-changing role as a public voice since the inauguration, his spiritual embrace of Americans everywhere, and his vision for poetry’s new role in our nation’s consciousness. Like the inaugural poem itself, For All of Us, One Today speaks to what makes this country and its people great, marking a historic moment of hope and promise in our evolving American landscape. In 2017, U2 is featuring “One Today” during their Joshua Tree tour throughout the United States and Europe. The poem will be projected on the stage screens as people enter the stadium to reflect and discuss America and the American experience. Selected by President Obama to be the fifth inaugural poet in history, Richard Blanco joined the ranks of such luminary poets as Robert Frost, Maya Angelou, Miller Williams, and Elizabeth Alexander. Standing as the youngest, first Latino, first immigrant, and first openly gay person to serve in such a role, he read his inaugural poem, “One Today,” as an honorary participant in the official ceremony on January 21, 2013. Blanco was made in Cuba, assembled in Spain, and imported to the United States, meaning that his mother, seven months pregnant, and the rest of the family arrived as exiles from Cuba to Madrid, where he was born. Only forty-five days later the family emigrated once more and settled in Miami, where Blanco was raised and educated. The negotiation of cultural identity and universal themes of place and belonging characterize his three collections of poetry, which include City of a Hundred Fires (awarded the Agnes Starrett Poetry Prize from the University of Pittsburgh Press), Directions to the Beach of the Dead (recipient of the Beyond Margins Award from the PEN American Center), and Looking for The Gulf Motel (winner of the Patterson Poetry Prize, a Maine Literary Poetry Award, and the Thom Gunn Award). His poems have also appeared in the Best American Poetry, and Great American Prose Poems series, and he has been featured on CBS Sunday Morning, and National Public Radio’s All Things Considered and Fresh Air, as well as major U.S. and international media, including CNN, Telemundo, AC360, the BBC, Univision, and PBS. Blanco is a fellow of the Bread Loaf Writers Conference, recipient of two Florida Artist Fellowships, and a Woodrow Wilson Visiting Fellow. A builder of cities as well as poems, he is also a professional civil engineer currently living in Bethel, Maine.